OSWEGO, NY – Trees are spouting up throughout the Oswego City School District as a result of a cooperative effort with the City of Oswego Community Development Office, the Oswego Tree Stewards and the city Department of Public Works. 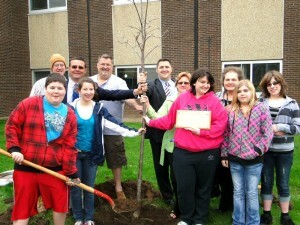 When the new tree went into the ground at Oswego High School gathering for the photo were members of the Environmental Clubs, City of Oswego and School District. Included in the picture are Michael Meaney, Phil McArthur, Superintendent of Schools Bill Crist, Tory Welsch, Phil Meaney, OHS Principal Brian Hartwell, Catherine Celeste, Monek Cullen, Paula Ranous, Mikayla Meaney and Alexis DeSacia.